In Division One the match of the round was undoubtedly played on the Friday Night at Kings Park where the undefeated Goodfellas took on Steve Cairns’ title aspiring youngsters. With Cairns away USRC where left to their own devices to take on Goodfellas which ended up a stalemate 1-1 draw after USRC took the lead. Reliable goal scorer Ed French once again netted a goal for Goodfellas with manager Stuart Pang claiming he surely must be near the top of the charts for goals scored after the match. Pang thought it was a good game, but felt a bit disappointed not to have won it although both sides will probably agree that the ref ruined the game in very much a stop start affair. Some further comments about the ref where best left on the editors cutting floor but it was clear Pang was less than pleased. USRC Scorer Sam Bensley was also disappointed his team didn't get the win especially the vital second goal with several 1 on 1s when USRC were 1 nil up but said he was glad to take the point in the end! Elsewhere league leaders Discover Bay extended Krauts winless misery at the bottom of the table with a dominate 3-1 win. DB starlet David Rollinson mentioned that they largely dominated the game, and were camped in Krauts half for most of the match. Three goals from Puis Kisambale, Dzadu Kouko Agbeko and Christian Romano where deserved but Rollinson Junior stated they struggled to break down a team concentrated on just defending. Krauts got a fantastic strike though for their goal from Björn Hasse. In a major scare in the game one Krauts player was knocked unconsciously in a weird 50/50 and everyone was very scared. Kafi saw that he had swallowed his tongue and managed to unblock his throat to everyone’s relief. The striker is doing fine, just a big headache said Johie the Krauts manager after the game. 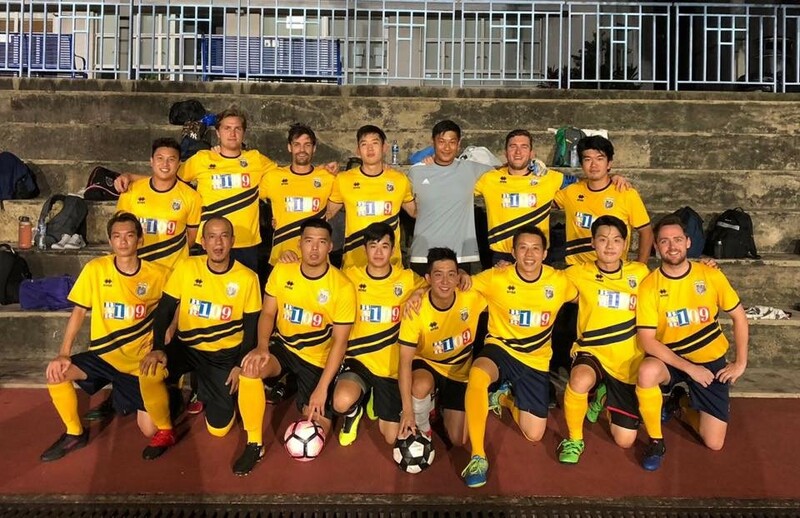 Jleaguers secured a 3-0 win against last seasons Division two outfit Soho Spartans at Happy Valley to keep their title aspiration as they lie in joint 2nd place on the table. In a game where quite a few veterans played in it for both sides it was the legendary Kenichi Sekino double that helped secure the win. However, it was youngster James Nortey former Soho’s player who produced J leaguers first goal off a shot about 25 min in that hit the post and then one of the soho’s faces right to James in box. Sohos manager Dan Harrison stated his side had a few chances in first half and I think we kept it close until the last 20 where they really had a majority of the possession and put the game out of reach. Last season’s Division 2 champions Bants are also finding it tough in top flight suffering another loss this time to HK Scottish Stags 3 goals to 1. Bants manager Jake Manhattan said that Stags came much quicker out of the traps than his side. They were 2-0 up inside the first 15 from Simon Lowth and Myles Winter strikes but a pretty decent game from then on, he added. Bants got back into the game with 15 left to go via a penalty from Rob Gorczynski, looked a soft hand ball decision, but we were probably unlucky not to have had a penalty 10 mins earlier added Manhattan. Stags sealed the game late on as Bants pressed for the equalizer with a Jonathan Bui goal. Corinthians also having a good run this season in equal second place played against a resurgent Wanchai outfit in a tough 2-0 win after the Spartans were reduced to 10 men. Pretty even first half with limited chances said Cors manager Hackett, Corinthians scored with one of the few chances of the half that trickled under the keeper from Anthony Forsyth strike he added. First 15 mins of the second half started like the first half, few chances with both teams being nullified. Then Spartans pushed strongly and hit the same spot on the post with 3 shots inside 10 mins, they may feel a little hard done by said Cors manager Dan Hackett after the game. When Louis Feighan came off the bench for the Spartans in second half and got two quick yellow cards to be sent off. Both managers felt the yellow cards were very harsh and unwarranted. Wanchai manager Peter Solomon said from my perspective corroborated by Cors manager both were harsh yellows, the first a slightly mis-timed challenge, the second a clumsy aerial challenge with no malice. Corinthians scored a second from Aaron Brown with about 10 to play and the game was then over as a contest. Both managers felt the ref seemed to blow for any contact and enjoyed overturning his linesman's decisions as well as a terrible red card. Last seasons champions AFC Forward finally won a game after a string of poor results with a close 4-3 win against Club Tropicana a real back and forth game said Tropics manager Kevin Reid. 6 goals came in the first half with Matthieu Demange scoring twice and Silvio Jit Ruprah also netting a goal for Forward with manger Reid in the unfamiliar keeper role. Club Tropics goals Kyle Wagner, Aidan Walker, Kwan Ip levelled the game at half time to 3 all. In the second half Matthieu Demange completed his hattrick to give Forward a win finally. The game saw 3 players get sent off to complete a busy week for Disciplinary Committee. Division 2 continues to take shape with numerous teams jostling for position in order to put themselves in the best place possible to achieve their season aims. At the top of the pile, San Pells made it 7 wins from 8 matches as they saw off the Dragons by 4 goals to 1. The result was maybe a little harsh as Dragons had defended well throughout the game but were done by 2 late goals to seal the points. Despite losing the encounter, the match report from Dragons’ gaffer won the day and provided a very detailed commentary of the contest whilst also admitting the San Pells boys had slightly better control of the game on this occasion. Gary Pratt (2), Peter Harrod and Charlie Clack continued the momentum for the league leaders who were even generous enough to score at their own end to make it 2-1 at the time. DV sit in 4th in their debut Legal League season and look like being a solid top half side this term. Mes kept the pressure on at the top (but only just) as they edged past Shooters 2-1. The Japanese side can count themselves unfortunate and take a lot of pride from their past two games having only lost by a solitary goal to the 2 strongest sides in the division. They led 1-0 at HT in this one but the extra quality showed from Mes as strikes from Lar Finnerty and Will Harvey turned the game on its head. Mes remain 2 points off top spot but with a game in hand. An improving Revo side now look like a ‘4s’ (sorry) to be reckoned with making it 4 league wins and 4 clean sheets on the bounce thanks to a 4-0 victory over MBFC. All this meaning that they can now go (you guessed it) 4th should they win their game in hand. MBFC dug in well and managed to keep the score to 0-0 at the break thanks in large to Revo’s wastefulness and a little bit of niggle. Half time team talk called for a good old-fashioned bollocking and after a couple of tactical tweaks, Revolution pulled away with it 2nd half. Dave Jessop got 2 before Adam Johns scored his first ever league goal with a glorious shinner. Jacky Zhang added some gloss but its back to finishing school for the rest of the side as a plethora of chances were squandered throughout. Old Speckled Men defeated BOCs by the same score to strengthen their top half claims. In a game of famous sportsmen; T Howard, B Wiggins and J White were all credited with finding the back of the net. G Wittevrongel got the other to break the trend. Samurai Blue continued their resurgence thanks to a 3-1 victory over a Legal Head side going the other way. Ahmed Jemli gave SB the lead running on to a perfectly weighted through ball. The game then turned on a couple of refereeing decisions (shocking I know!) as Legal Head had claims for a penalty waived away before a similar incident saw a penalty given at the other end. Younes Aboubker made no mistake from the spot, putting SB 2-0 up at the interval. 2 became 3 in the second half as Christopher Matthew Corcoran broke away before veteran Viktor Cherednychock grabbed a consolation with a late header. Both sides agreed the ref lost any semblance of control in this one booking 8 or 9 players and failing to manage a feisty encounter. Vikings went into their game with Shui Wei 5 points adrift of their opponents but this mattered little on the day as they cruised to a 5-1 win in one of the stand out performances of the weekend. Jawid Mirzadah (3) and Kristian Skjorshammer (2) bagging the goals in another slightly high tempered affair. John Zhou had scored to make it 2-1 at HT but Vikings upped it 2nd half to seal a comfortable win. In one of the biggest games this week, KCC Cavs took on Wolves in what proved to be an epic Monday night battle. Cavs came out firing and channeled their inner-Pep with a high press paying dividends. Ryan Jarvis, Bennis Wong and Chan Ming Kong all took advantage to propel their side into a 3-0 lead. Jonathan Hamblin swept home following a corner to give Wolves a glimmer of hope at 3-1. A change of tactics and a much more direct approach inspired the most unlikely of comebacks as the Crazy gang style long ball unsettled the young Cavs side. Headed goals from Victor Johanssen, Jamie Milne and Hon Ng in the 2nd half secured a dramatic 4-3 win for Wolves in a real classic under the lights. That result meant Royals were left to fly the KCC flag again and they duly obliged with a solid 2-0 win over Young Guns. Scott Allen and Ben Cadman on target to move Royals back in to the top half discussion. Young Guns actually have a decent defensive record in the league but it’s at the other end where their problems persist having managed just 10 goals so far this season (6 of which came in one game) leaving them languishing down in 13th and with work to do..Waiting on Division One report.